You may have eaten them as part of the tasty Falooda Kulfi Dessert but do you know that Falooda Seeds or Sabja Seeds can be beneficial for your entire body? From reducing stomach problems to making you pretty, Sabja Seeds are a wonder food that you should have regularly. Here’s a look at some health benefits of Sabja Seeds and other info on them plus expert advice by experienced dietician Reema Madhian. How To Have Sabja Seeds? 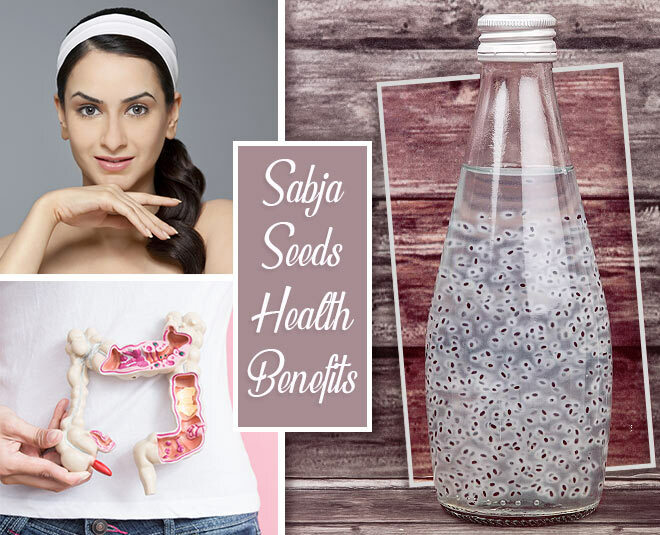 Just soak 1-2 teaspoons of sabja seeds in a glass of water. The seeds will swell up and make a gel-like consistency. Drink this water and chew the seeds to gain the health benefits. Sabja seeds or tulsi seeds contain 50% linoleic acid, 22% linolenic acid, 15% oleic acid and 8% unsaturated fatty acids. These omega 3 and omega 6 fatty acids reduce inflammation in body and speed up your metabolism to suppress fat production in body. Having sabja seeds also makes you feel full because of its fibre content, so you are less likely to binge. Eating falooda seeds regularly improves the proper functioning of the hormones that control digestion. So if you are suffering from constipation, bloating, acidity, heartburn or any other problem, just have sabja seeds with a glass of milk or water to clean and cool down your angry tummy. Do it every day before going to bed and see the results. Consuming sabja seeds makes your skin and hair healthy too! Packed with proteins, iron and Vitamin K, tulsi seeds can help you get a thick and shiny mane of hair. As for your skin, just mix 1 tsp crushed basil seeds in coconut oil and heat it. Filter this and apply over your skin to watch skin problems like psoriasis go away like they never existed. Today’s fast-paced life means our blood sugar level fluctuate pretty easily. Counter this to avoid diabetes by having sabja seeds to control your blood sugar. Sabja seeds work by slowing down the action of enzymes that break down carbohydrates so that glucose is released slowly in your body. Apart from these health benefits of sabja seeds, they are also known for curing cough and reducing body heat in summers. Gulkand is another wonderfood with cooling effect. Read about it here. "It is best to have sabja seeds soaked in water on an empty stomach every day. You can also have it with salads, curd or dal. In summers, I generally recommend taking sabja seeds with the seasonal fruits such as mango, strawberries and banana mashed with milk to make a wholesome dish. Add sugar to it if you like or go for sugar free if you are aiming for weight loss with sabja seeds." So if you want to stay healthy and look healthy too, start having this superfood starting today! To know more about amazing benefits of other health foods such as brown rice and camel milk, keep reading Her Zindagi.